We don’t know yet. And we don’t know if we ever will. During the 2016 Congressional District 8 race, your author called up one of the smartest people in state politics we know. This fellow lives outside MoCo but he tracks all parts of the state and has sources everywhere. When we asked him who was going to win, he said, “When I talk to the various campaigns, all of them say they’re gonna be the last one at the end along with Jamie Raskin. When I hear that over and over, when I see that they all think that Jamie is the man to beat, that leads me to think Jamie will win.” That dynamic is going on now in the Executive race. 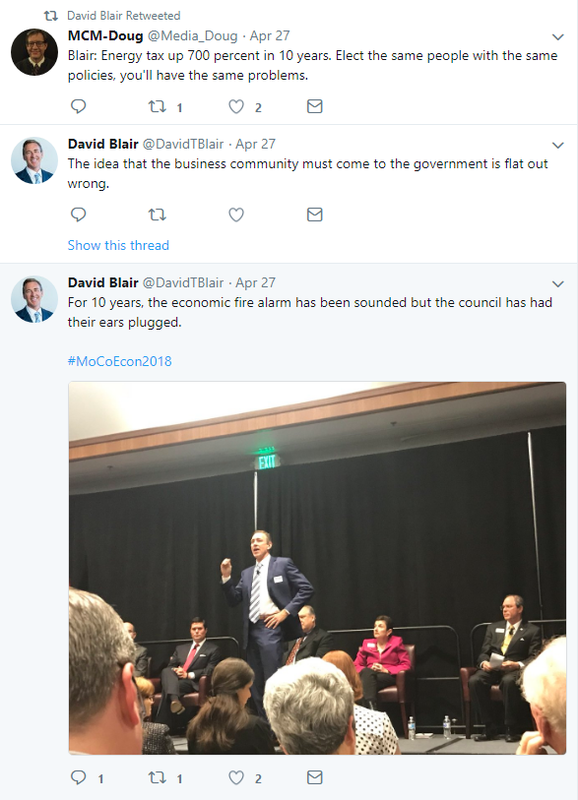 Elrich’s long-time message combining opposition to development with far-left progressivism has earned him an overlapping base of land-use voters, liberals and Downcounty residents, especially in and near Takoma Park, where he served 19 years on the City Council. In the 2014 Council At-Large race, Elrich finished first in every council district except 2 (where he finished second to Nancy Floreen) and first or second in every local area in the county except Damascus and Laytonsville. He finished first in 138 of 251 precincts. In the 2010 Council At-Large race, Elrich finished first in all five council districts and in every local area in the county except Cabin John, Damascus, Darnestown and Laytonsville. He finished first in 166 of 243 precincts. No other MoCo politician running for county office in this cycle has a base of this kind. A year later, Elrich cast the lone vote against that master plan as he has with several other plans. This plan’s opponents have now been incorporated into Elrich’s base – assuming they were not part of it already. While other candidates struggle to attract volunteers, Elrich’s volunteer base is well established. 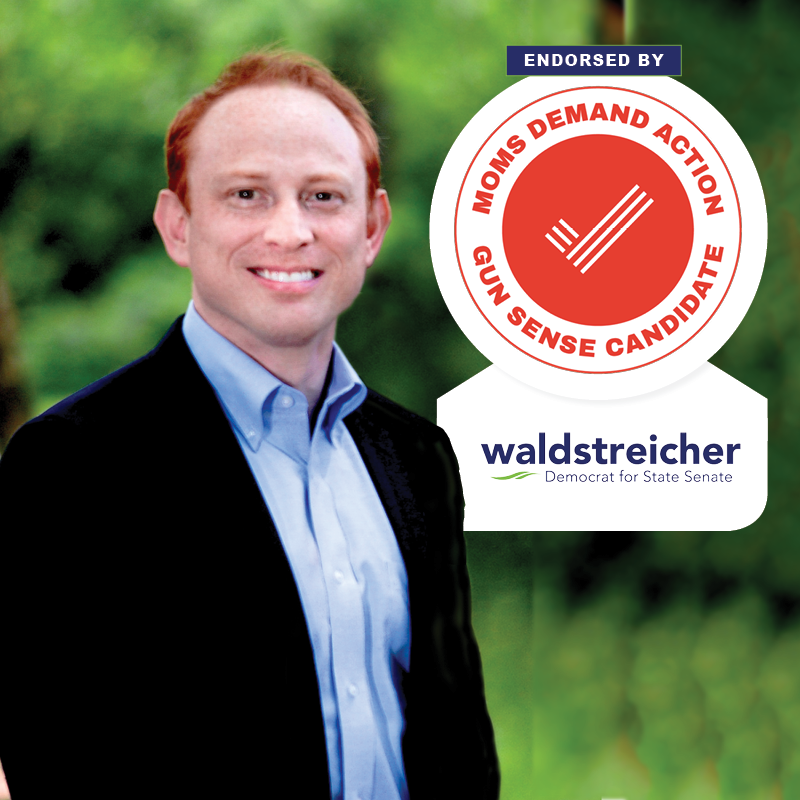 In 2014, the campaigns of Elrich and his ally, Beth Daly, posted poll coverage sign-ups on Signupgenius.com. They were able to recruit coverage on 67 precincts, many on more than one shift, with particular strength in the voter-rich areas of Silver Spring, Takoma Park and Leisure World. No one other than the Apple Ballot could touch this. Now that he is running for the county’s highest office, how many precincts will Elrich be able to cover? All of the non-Elrich candidates have potential as well as challenges. Council Members Roger Berliner and George Leventhal are running on their experience and qualifications. (Disclosure: your author respects both but supports Berliner.) Berliner is trying to get known outside his council district and Leventhal has been severely out-polled by Elrich in the last two elections. Delegate Bill Frick, former Rockville Mayor Rose Krasnow and businessman David Blair are the fresh faces. But they are little-known in most parts of the county and Blair started as a complete unknown. All of these candidates have a long way to go and each of them is in the others’ way. 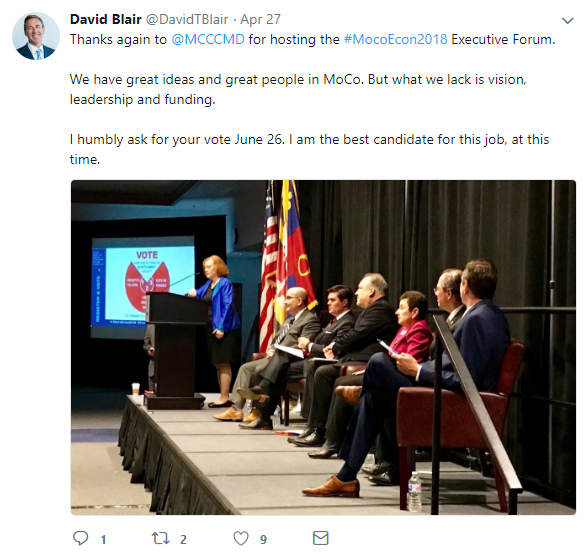 To contrast with Elrich effectively, a non-Elrich candidate needs to hit this sweet spot dead-on: “We live in a great county, but we can be even better. Here are some ways we can improve.” That involves a bit of threading the needle for the two council incumbents. It’s understandable that they might react to critiques of the county’s economic performance as criticism of their records, but they should think of it like this: every Executive leaves unfinished business for the next Executive. Ike Leggett inherited his share of problems from Doug Duncan, who in turn inherited some issues from Neal Potter. This is entirely normal, so who is the best choice to lead in the future? As for the non-incumbents, they aggressively point to the need to improve, but they tend not to have many specific proposals to get better because they don’t know the history and operations of county government as well as the two Council Members. To be fair, how could they? If no one hits this sweet spot, that leaves Elrich as the only candidate with a crystal-clear message that is distinct from the others. Those who hear Elrich’s message and agree with it are less likely to peel off to someone else than tentative supporters of the other candidates who might change their preferences between them. One more thing: we wouldn’t be surprised if most, if not all, of the non-Elrich candidates have polled. If so, they all probably found similar results. And so they could all tailor their messages in similar ways and maybe even say the exact same things. That would blur the differences between them and make Elrich stand out even more. This may already be happening as Berliner, Blair and Frick all repeatedly mentioned “innovation” at last Friday’s Executive forum. Was that a coincidence? If questioned privately, we bet all of the non-Elrich candidates would grudgingly admit that it’s a problem that five of them are in the race. Each of them wants to be the person who gets to take on Elrich one-on-one. So each of the five is looking at the others and saying, “If YOU all get out of the way, I can beat Elrich.” But no one is dropping out because they all think they have a shot. The big winner from this is – you guessed it – Marc Elrich. One non-Elrich candidate needs to emerge from the pack and consolidate everyone that is not in Elrich’s camp. If that happens, Elrich is beatable. But if nothing changes and this election continues down the path it is on, Elrich will win with less than 40% of the vote. 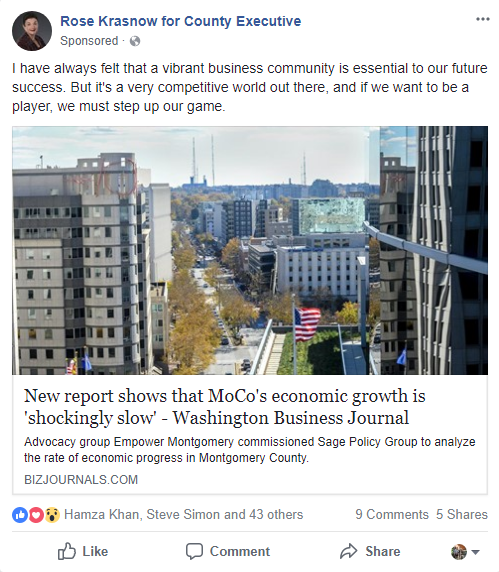 Ben Jealous’s campaign blasted my posts about his voting record with its own blog post earlier today. 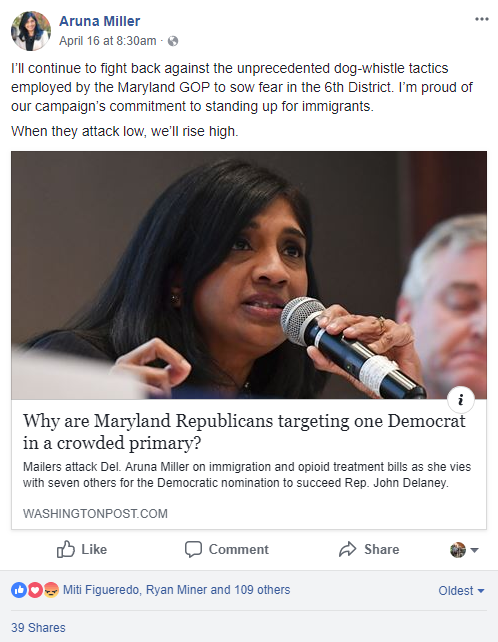 If nothing else, my posts have helped clarify the voting records of the candidates, a topic Larry Hogan will be sure to bring up if the nominee is vulnerable. Could I have done so in a better way? You bet. (For example, it was pointed out to me last night that I should have indicated that Krish Vignarajah was simply too young to vote in some elections on the chart.) Jealous’s post, however, is a combo platter of legitimate grievance, high dudgeon, and deception by omission. Jealous says he has voted in Maryland exactly four times: the 2012 general election, the 2014 election, and the 2016 primary and general elections. This is exactly what I reported in my post on the Maryland voting records of all candidates. As Jealous has now made clear, he did not vote in Maryland previously because he was living in D.C. and California. When he became NAACP President, he moved “back to D.C.” The NAACP headquarters are in Baltimore, though the organization also has a Washington bureau. Jealous further claims that, contrary to my statement, that he has “long been” a Democrat but then says that he “chose to be formally unaffiliated during his time as president of the NAACP.” Fair enough, but this also means that was, in fact, not a registered Democrat from 2009 to 2013. This neatly elides over and omits that he didn’t participate in the 2014 Democratic primary, the only gubernatorial primary for which he has been eligible. He left the NAACP in 2013, so his stated reason for being unaffiliated no longer held. Certainly, the 2014 Democratic primary was exciting with a gubernatorial race between Anthony Brown, Doug Gansler, and Heather Mizeur. Bottom line, Jealous has voted four times in Maryland since 2012. He has never voted in a gubernatorial primary, as he skipped the 2014 Democratic primary. According to Jealous, he was not a registered Democrat in 2012, so he was unable to vote in that primary. Jealous spends much of the post, which appeared today, attacking claims I made two days ago but realized on my own were not right and corrected within hours as soon as I had that facepalm moment. I took the unusual step of putting out a separate post highlighting the corrections, so that everyone who gets 7S in their mailbox would see it. Additionally, I tweeted and put up a post on the blog’s Facebook page with the correction. All state: “My apologies not just to Ben Jealous but to readers for the errors.” The original post is not only corrected but contains the same wording at the top highlighting the corrections. I make mistakes and I try to take my lumps and to correct them when brought to my attention. It’s part of my effort to maintain trust with the people who read as well as my own standards. My time is limited since I have a full-time job and other responsibilities, so I mess up sometimes but I do my best. While I certainly have opinions, I regard facts as friends and try to adhere to them. I can only speculate why Jealous chose to spend so much time expressing outrage about the corrected errors. It might be in order to distract from that his voting history and residency in Maryland in much shorter than others might think. He might also rather direct attention to me rather than his failure to vote in the 2014 Democratic primary. Where Jealous has a good point is that I did not know about his California voting history, which occurred in the middle of his two periods voting in D.C. Why didn’t I know? I looked as his campaign bio page, which makes no mention of having lived in either D.C. or California. I learned that Jealous had previously voted in D.C. Like Vignarajah in Maryland, he was never purged from the rolls during his time in California. I had no idea from his bio, which I looked at prior to putting up the post, that he had lived in California. So I wrongly stated that he had missed elections in D.C. when living in California. Nevertheless, in retrospect, it would have been best to have taken the time to ask the Jealous campaign. Of course, Jealous could have done the same if he wanted the errors corrected. We both know how to contact each other and my corrections and apology for the errors indicate a willingness to fix others. Unlike me, he has a professional, paid campaign staff. Instead, his blog post blasts me two days after many of the errors were corrected. I’m certainly not above criticism. When you put your opinions out there, you should expect some flak, especially when you make mistakes. At the end of the day, however, I’m not up for election. It’s up to voters to decide if Jealous’s voting history or residency matters. I imagine voters have a range of opinions on these topics – and they’re absolutely the ones who matter here. An elementary school has just received an addition due to housing turnover, new development, and a boundary change that was intended to address split articulation patterns and crowding at other schools. After the addition was completed, the school immediately became over-crowded again and now has four portables. More development is underway in the area, and it will cause even more crowding at the school. Due to county policy, future development goes into moratorium when a school is forecast to be over 120% capacity at year 5 in the budget, unless there is a “solution.” That solution can be a “placeholder,” money put in the budget that covers the extra seats a development will create, based on the County’s “student generation rates.” This money is not tied to a specific plan. It is only there to prevent the area from going into moratorium. The school system promises to develop an actual project in time for the seats to materialize in the next 5 years. This school gets assigned a “placeholder” by the Council since a capacity project is not included in the Board of Education’s recommended FY19 budget. A school has been over 120% capacity since 2011 and is at 151% today. A plan to address the overcapacity is not included in the Board of Education (BOE) Recommended FY 19-24 budget. Since there are no pending development projects in this part of the county, no “solution project” is proposed by the County Council, and the area officially goes into a housing moratorium. Scenario 1 is in Bethesda, scenario 2 is in East Silver Spring. Neither community is happy with place holders! I will first explain why the areas with development aren’t happy. The scenario 1 school, Bethesda ES, is in an area where housing development continues. In fact, there are an additional 11 buildings submitting applications in the area under a recently approved master plan. Somerset Elementary School is in a similar situation and the Council has proposed a placeholder for that school as well. 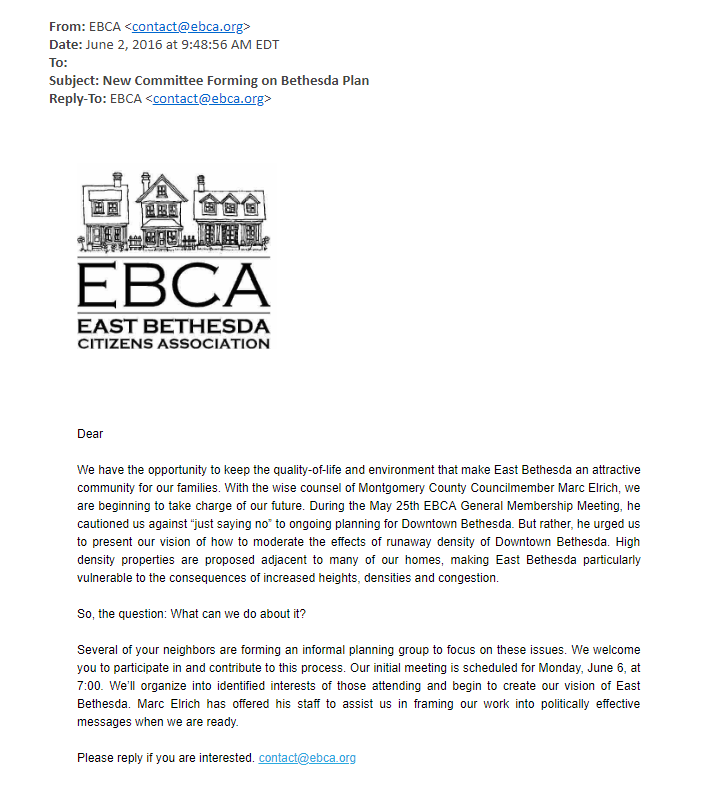 There is no actual plan for another addition at the Bethesda school (which may not even be possible, given the small site size,) or a plan for a new elementary school nearby. New schools, even at properties MCPS already owns, are much more expensive than additions. Additions also can cost more than the placeholder price tag that is included in the budget. Placeholders are supposed to guarantee seats in 5 years, but the past has shown that projects almost never get done in that time period. Of the last five placeholders that had a due date before 2018, only one project finished by the due date. Another 4 placeholders added in FY15 were postponed the following year. Continuing development with a placeholder causes schools to go way over capacity, often much more than the initial 120% threshold, by the time there is a real solution. Now let’s look at Scenario two. East Silver Spring does not have pending development. The school that is the most overcrowded in the area is Burnt Mills ES, at 151% and over 200 children are in portables. In fact, this school has been over the 120% threshold since 2011, when the feasibility study was done. No project for this school is in the FY2019-2024 CIP. They will be considered in the new renovation and expansion program in a future CIP, but there are limited funds and there are many schools that will be considered. There are no guarantees for this school. So this area is now officially in moratorium, and has been for a while. Relief at Burnt Mills seems elusive without any project on the books. Parents feel like they do not get the attention that other areas with lots of development get. They are not wrong. Even though placeholders aren’t solutions, at least the conversation about a possible solution takes place at the County Council. Seven areas are in housing moratorium in Montgomery County, but only three had placeholders proposed to be added in this budget cycle, two in Bethesda and one in Gaithersburg. I’ve spoken to parents in Bethesda that would rather have a building moratorium take place so the County could take time to come up with a real planned solution. The Gaithersburg school, Judith A. Resnik ES, had an addition project scheduled with a completion date. The enrollment there is trending down slightly, but is still projected to be at 122% capacity within 5 years. To avoid a moratorium, the County removed an actual project (the scheduled addition), and added a placeholder. Real money is taken out of the MCPS budget for placeholders, instead of actually using those funds for planned projects. In fact, several projects that were proposed in the BOE Recommended FY19 Budget are slated to be delayed due to lack of funds, including Col. E. Brooke Lee Middle School. It is considered a “sick” building by many teachers and parents. Mold and other issues come up regularly. They were elated to have a project that had a completion date of September 2021, only to be deeply disappointed when they were included in the delay list. Placeholder money – used to avoid putting development in moratorium- could be allocated NOW to schools with greater needs than the areas with pending development. Placeholders compete for scarce funds in the CIP. There is another unintended consequence of giving placeholder money to areas of higher growth. These areas tend to be more affluent. So the optics continues to perpetuate the perceived and the real divide between East County and West County. For instance, there are huge disparities in wealth in our two scenarios. Bethesda ES has a 7.3% Free and Reduced Meals Rate (FARMS.) Burnt Mills ES has 67.1% FARMS. The affluent area gets the attention of councilmembers and solution/placeholder projects – that may or may not actually come to fruition – while poorer areas are left out. This policy also divides the County North and South too, because rural areas do not have the growth that down county areas receive. I am in no way blaming Councilmembers or insinuating that they mean to ignore certain areas of the County. I know that many fight for scarce resources, and fight to bring economic growth in underperforming areas of the County. I am blaming the processes and policies that perpetuate inequalities and perception of inequalities in our school system. I propose changing the system. We can come together as a community and find a better way forward. Let’s get developers, Council Members, the Board of Education, the MCPS Division of Long Range Planning, and the Planning Department together and come up with REAL solutions so we can finally build real classrooms for kids, no matter in which zip code they live. Laura Stewart is the CIP Chair for the Montgomery County Council of PTAs. Tonight, I’m planning to live tweet the Montgomery County Women’s Democratic Club gubernatorial forum. It starts at 7PM and will feature all seven of the Democratic candidates. Below is the information on the forum. It’s at the Silver Spring Civic Center in case you want to attend in person. My twitter handle is @theseventhstate. The Woman’s Democratic Club of Montgomery County (WDC) is hosting a Forum in Silver Spring on April 24 for Democratic Gubernatorial Candidates in the June 26 primary. 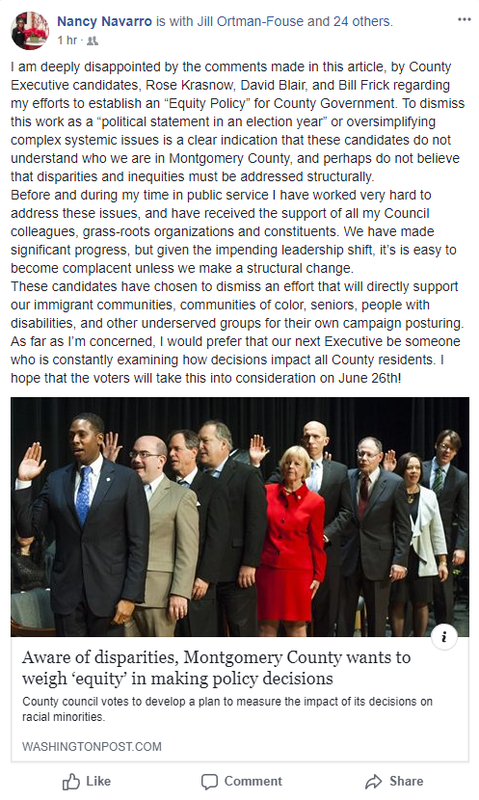 Contenders Rushern Baker, Ben Jealous, Kevin Kamenetz, Rich Madaleno, Alec Ross, Jim Shea, and Krish Vignarajah have agreed to participate. Washington Post reporter Ovetta Wiggins, who covers Maryland state politics, will serve as moderator. This timely public educational event represents an excellent opportunity to hear these aspiring governors discuss how and why they think they can defeat Gov. Larry Hogan in the November general election. They will also respond to questions about their priorities and highlight their differences through the lens of policy issues important to women and families. This forum will begin at 7:00 PM at the Silver Spring Civic Center, 1 Veterans Place, Silver Spring, MD. This is a free event but attendees should register on Eventbrite: https://bit.ly/2tSXpAl. For more information and to see a complete listing of promotion partners, visit the above link. Attendees may, when they register, name one important issue they would like to hear the candidates address at the forum; responses will be submitted to event organizers. The WDC, which has more than 600 members, was established after the 1956 Presidential Election. This event continues the Club’s long-standing tradition of supporting Democratic candidates and keeping voters informed.